The tool is designed for adding files in Batch process. Add multiple PST files at once for Outlook different versions in the single event without worrying to add files one by one. “Add Folder” button of the tool serves the purpose to Add PST file in Outlook in bulk. The tool gives the details of each PST file when it is selected using “Add Folder” option. File name, size, status & directory path is mentioned to manage the files properly in Outlook while adding them. The Software has option to add more than one pst at a time in outlook with the entire list. User can add multiple PST Files to Outlook 201o/2007 version, but MS Outlook installed and configured on the configured system. Add PST tool gives the option to choose & add only the required PST file to Outlook from a selected folder. Only those PST file are added which are checked while the unchecked gets left behind. Add PST software is designed in such a way that a non-technical user can easily cope up with the simple steps needed for Adding PST file to Outlook. The user interface has single panel with multiple options to work with, thereby providing simplicity. The designing team made the “Add PST” tool for enhancing the user experience for desktop. All the working options to Add PST file in Outlook are present on the single interface. An ADD PST Software can import multiples PST into configured Outlook profile in Bulk. The Tool supports both old (ANSI) and new (UNICODE) File format used to store messages. User not to worry about the bit version of the installed Outlook, as software can work flawlessly work with both 32 bit & 64 bit. To import PST file in Outlook profile, a user needs to configure the Outlook account in the configured system, otherwise user not able to add the PST file directly into the Outlook account. Why we Add PST File in Outlook? 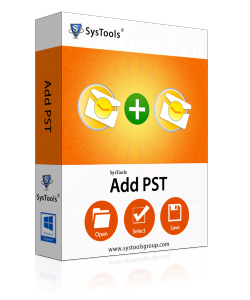 Download & Install ADD PST Software. Click on "ADD File" or "Add Folder" option. Import files in MS Outlook by "Select All" option or choosing from the list..
Click on "Add PSTs to Outlook" and the PST files are added..
Click "OK" to complete the successful import of PST file in Outlook. Check MS Outlook for the imported files. Add PST File to Outlook Tool- Replies All Doubts & Queries! Does Add PST file to Outlook tool supports Windows 8/8.1? Yes, users can easily install the Add PST software on Windows 8/8.1 and below versions. How many PST file can be added using the tool? You can Add multiple pst files at once in Outlook without any limitation. Does the Add PST Software works without Outlook installation on the system? No, users must install MS Outlook and configure it properly prior to add PST to Outlook. Can Software also split the Outlook PST Format file? No, To break Outlook files, a user can go for PST Splitter Tool for OST file. I was searching a tool which could add multiple PST files at once in Outlook as I had a huge PST file database containing employees profiles. Add PST tool sorted out my issue. Thanks to the developer. This small and simple tool did my work at ease by importing PST files to Outlook. Works fine with all Outlook versions. A great utility to add multiple pst files of MS Outlook. Kudos! To the creative team. Adding large numbers of PST file different version in in my Outlook of account can be a tough task, but ADD Outlook PST Tool solve my problem by importing all file without any data loss. PST ADD Software designed such a way that even a nontechnician person can import PST file into Outlook account. Within few clicks , I just import all my emails, calendars, contacts, tasks and journal file into my MS Outlook.